Nasmejan otroški obraz vedno ogreje srce. Prav nasmeh na sličici me je prepričal, da je to štampiljka,ki jo bom uporabila za tokratni izziv pri Creative Moments. Za izdelavo voščilnice sem uporabila sponsorsko štampiljko Christmas cat, (Bestie), ki sem jo pobarvala s Prismacolor barvicami. Dodala sem še nekaj izrezov in bleščic, da sem pričarala zimsko sceno. Toll gemacht. Danke für deine Teilnahme bei den Sketch-Tanten. I love the trees in the background! Super adorable Besties image! Thanks for sharing it with us at Lil Patch of Crafty Friends! Ooh such a cute card. I love the trees through the window. Thanks for sharing with us today over at Digichoosday. Lovely card! 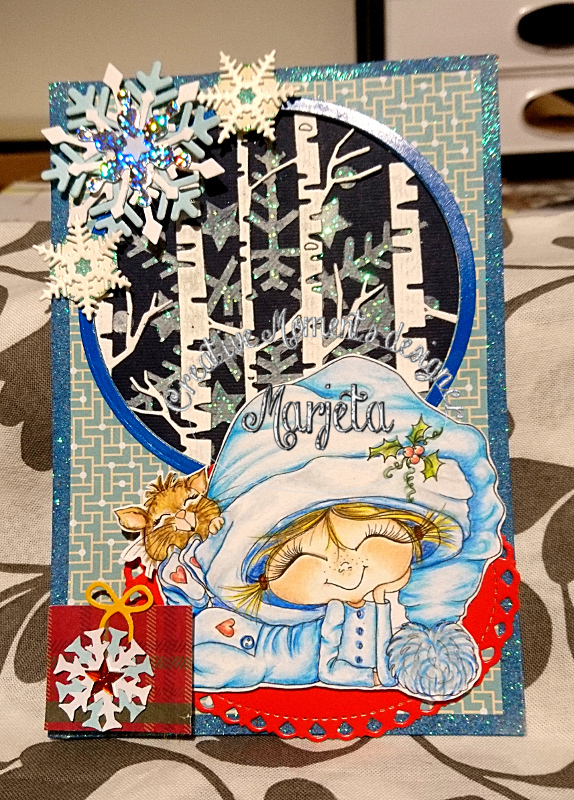 Thanks for sharing with us at Crafty Hazelnuts Christmas Challenge. Lovely card, very wintery. Thanks for sharing with us in our Anything Goes challenge at Aurora Wings this time. Good luck. 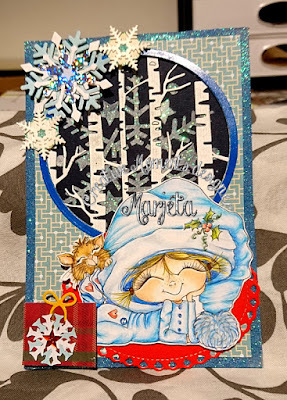 Love your card layout and your colouring is great too! Super card, tahnks so much for sharing it with us over at Digi Doodle Studios!